You'll find many, many uses for these mini storage bags. Put them next to your sewing machine to corral seam rippers and other tools. Put one in the bath to collect makeup together. 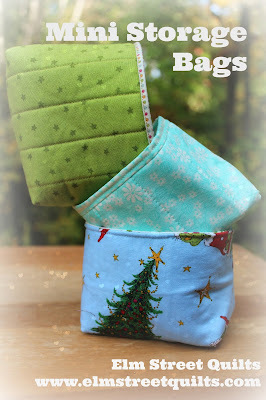 Make some in holiday fabric and tuck some small gifts inside. These bags are made identically to the large storage bags we talked about on this post. Just the dimensions are different. The technique for assembling these bags will seem very familiar if you've already made a zipped pouch. Iron 2 pieces of fusible fleece onto each of the outer fabric and quilt as desired. This sample has 1'' quilted lines. Put lining and outer fabric right sides together and sew a seam across the top. No zipper to sandwich in between! Take each of your two units and put them right sides together, lining up the edges of the outer and lining fabric. Sew around the entire unit leaving 2 to 3 '' open in the lining to allow for turning it inside out. Box the corners of the outer fabric and the lining at 1'' from the sewn lines. Sew the opening in the lining closed by hand or by machine. Top stitch the top of the outer fabric to the lining. Now make more.... and more of these. They are seriously addicting. Quick and easy. They make good little thread catchers next to your sewing machine. Put them all throughout your house to collect little items. Fill them with candy and now you've made a great gift extra sweet. They don't take much fabric and you can even fussy cut so the Grinch peaks around the corner! I really love the fabric I used for the lining with the Grinch - reminds me of all the decorations in Whoville. See the Elm Street Quilts Bag It information page for links to more tutorials. Oh I love that Grinch fabric - I have an entire set of Grinch FQ's downstairs from a long ago purchase during a shopping trip Stateside - I need to pull them out and do something with them. They're not having very much fun hidden in a container in the basement dungeon - I'm sure they'd rather be out here making people smile :D The next time I make a basket or a box I am doing the lining a bit larger, like yours - such an easy way to get a little extra kick of fun in a project! I can't imagine needing a tiny storage bag like that in my every day life but it looks like something nice to put in the entry way for keys and coins!